Another day of floods, another LibDem donor row, more data lost, another pop at welfare reforms, and Simon Cowell becomes a father. In such company, the Mirror's exclusive on child euthanasia stands out. A real hard news story, something we don't remember seeing before. But what a coincidence that it should surface the day after Belgium voted to legalise the 'mercy killing' of minors. so-what Cowell story. What's going on here? Well for a start, it came from an extraordinary source for an 'exclusive': an LBC debate hosted by Nick Ferrari, whose radio programme has a regular audience of around 650,000. Or more. That figure relates to official figures for the last quarter of last year - but it could well be higher now, since LBC became available nationwide last Tuesday. Not so exclusive then. But still pretty explosive.Until you see who is making the allegation. Dr Michael Irwin is an 82-year-old euthanasia campaigner who has previously said that he has helped people to die through Dignitas in Switzerland. His challenges to police to arrest him have so far gone unheeded. This time round he was commenting on the new Belgian law. He told LBC that he was aware of 'one or two' terminally ill children in Britain who had been given a 'double effect' overdose - one that would relieve pain but also hasten death. Asked by the Mirror if his allegations were true (presumably the follow-up phone calls were the exclusive bit), he said 'Yes', but would give no further details. No ages, no genders, no details of the doctors involved. Jeremy Hunt responded to the allegations by saying that he was not aware of such cases, but would 'look into' whether the law had been broken. The Mirror presents this as Health Secretary orders probe into 'euthanasia deaths'. But he could hardly say 'I don't believe you, go away', could he? However insignificant the Cowell story was, at least the Mirror could be confident that its second edition splash was 100% true. Now here's a thing. 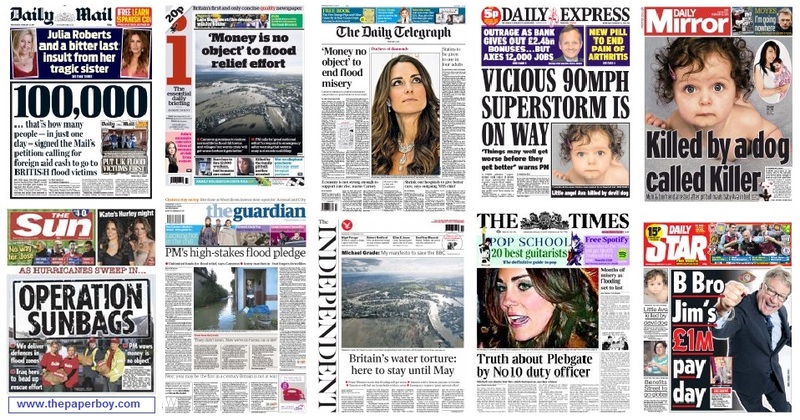 The floods are still the main story for the Express, i and Times, and a front-page story for the Telegraph. Naturally, everyone has extensive coverage inside. 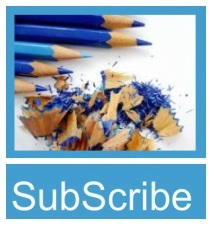 And this is what puzzles SubScribe. They all have photographs of Princes William and Harry up to their thighs in water heaving sandbags around a school in Datchet. The story goes that they had been pondering how to help and had decided to go incognito at 6am yesterday. It seems they had been working for four or five hours before being spotted by a Guardian reporter - who soon felt the caustic end of the princes' tongues. The Queen had meanwhile been sending farmers in Somerset feed and bedding from her Windsor farms. It is no surprise that the tea-tray sliding gold medallist Lizzy Yarnold was the popular choice for front-page picture. 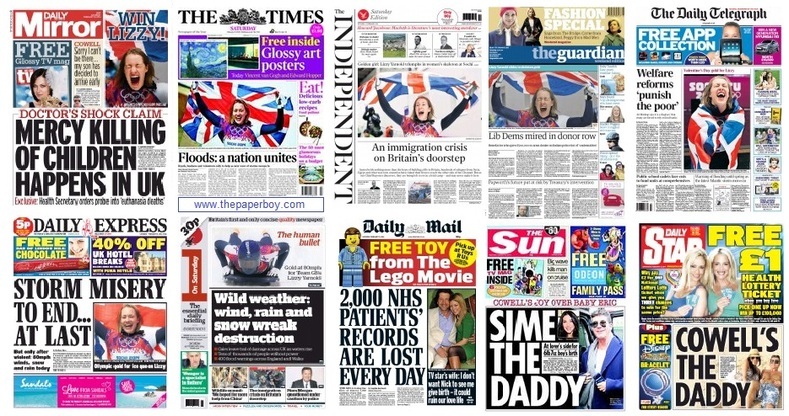 What is surprising is that only one paper mentioned the royal involvement in the rescue effort on page one. And it wasn't the Telegraph or Express. 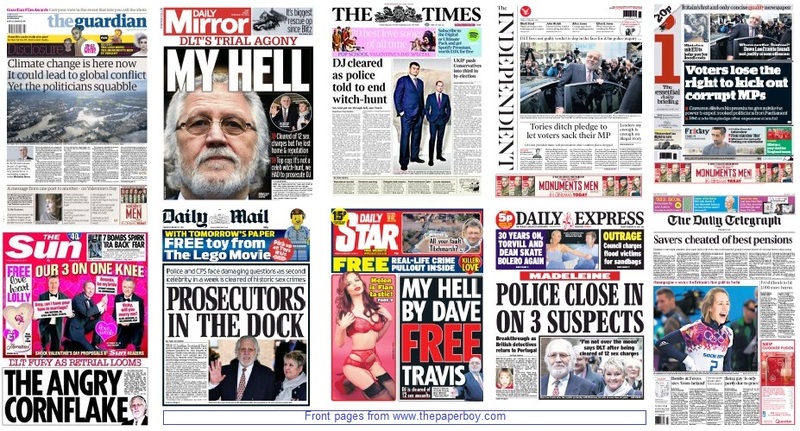 The Star, Mirror and Sun concentrate on Dave Lee Travis's personal angst - the Sun's Angry Cornflake headline is rather good - while the Mail is back on the warpath for the CPS. It does restrain itself from the 'why was he ever charged' approach and the inside coverage is more balanced than after previous verdicts. The Times goes completely astray with its splash heading. Police told to end witch-hunt? Who is saying this? Who says there's a witch-hunt? Is it official now? Not at all, DLT's lawyer thinks there has been a witch-hunt and he thinks it should stop. Does that justify such a stark heading that sounds as though a directive has come down from on high? It is worth mentioning that this case, as with Michael Le Vell and William Roache, could have been halted at any time during the legal process. Magistrates did not have to commit for trial. The defence could have contended there was no case to answer after the prosecution had put forward its evidence. The judge could even have directed the jury to find the accused not guilty. That each ended up being determined in the jury room suggests that, however flawed, these prosecutions were founded on more than folly. The Telegraph and the i also produce less-than-perfect lead headlines. 'Cheated' is a strong word for the dubious practices of insurance companies that fail to tell customers that they might get better value if they buy an annuity from a rival. It's notoriously difficult to get your head round financial services products and they should all be required to simplify everything. But what about caveat emptor? Do we take no responsibility for ourselves these days? If one message has gone out loud and clear in this consumer age it is 'shop around'. But no, people trying to sell us things have to tell us that someone else could give us a better deal. The i tells us that we're going to lose the right to dump corrupt MPs. But can you lose something you don't have? This is Cameron apparently planning to break a promise he made after the expenses scandal. The Independent goes on the same splash, with the right heading. The Guardian has abandoned news entirely on its front, leading with an essay on the dangers of global warming from the Nicholas Stern, president of the British Academy. It then marks Valentine's day by printing a poem by Wendy Cope for her husband. The couple have been together for 19 years and married last year, reluctantly because they preferred the idea of a civil partnership - which is not available for heterosexuals. It's a nice poem, but a very soft story that is nearly a year old. The Sun and the Times are the only others to acknowledge Valentine's day - both in their puffs - but it is the Express that shows the steadfast loyalty that is the mark of true lasting love. Police, you'll be relieved to hear, are on the trail of three suspects in the Madeleine McCann inquiry. The same suspects it wrote about on January 13, 24 and 30? The ones who were to be arrested 'within weeks' of July 22 last year? We await developments. Keir Starmer (Guardian) One reason why the cases of the four victims who did report allegations against Jimmy Savile during his lifetime were not pursued was because police were over-cautious after being accused of 'trawling for victims' in the past. So they decided not to tell any one victim that they were not alone in making their allegation. Do we really want another Savile moment? Robert Verkaik (Independent) The immediate rawness of a criminal trial is a never a sensible moment to get carried away with sweeping changes to our long-tested criminal justice system. 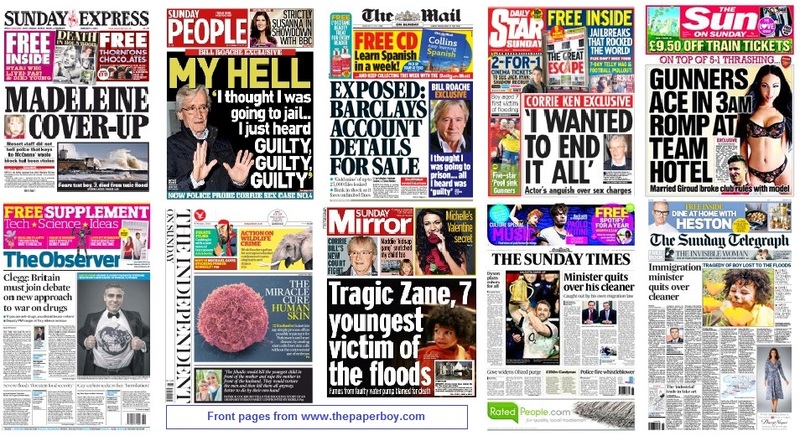 Carole Sarler (Mail) As good juries throw out ill-considered cases dating back decades, what effect will that have on a woman today who is the victim of sexual abuse and may feel she won’t be believed? wrong people expect the Prime Minister to be in charge. This is why, when the storms have subsided and the damage has been repaired, a proper dredging of the quangos should begin. Mark Steel (Independent) Why was Nigel Lawson on the radio, telling us angrily that the floods are nothing to do with climate change? Will this be a regular slot, in which people from the 1980s are invited to shout, with no evidence, that everyone else is wrong? Next week Depeche Mode will be screaming that the koala bear is actually a flower, then Torvill and Dean will yell that triangles only have two sides. Frederick Forsyth (Express) Merit is no longer the criterion for promotion and utter failure attracts no sanction, let alone dismissal. Our public sector – essentially the quangocracy – is a disgrace, ripe for the chainsaw. Spot the difference: which storm is coming to get us? Three papers use satellite pictures of the swirling storms threatening us - but not all the same shot. The Mirror's 'triple whammy' isn't any such thing, according to the weather man Tomasz Schafenaker. Rather it is a two-day old photograph and, says Schafenaker, 'not our storms at all'. He has meanwhile posted a further photograph on Twitter this morning of the storm expected to hit the UK tomorrow evening and weather enthusiasts may like to look at this.The Mail ran the same picture as the Mirror, with the same labeling online, but has since changed it. Accuracy isn't having a good day. The Mirror, Mail and Telegraph all make a play of the quote 'unparalleled natural crisis'. Is it? Really? The weather isn't much fun at the moment and hundreds of thousands have now been affected. But unparalleled? Aren't we getting it all a bit out of proportion? And who said this anyway? 'An expert', says the Mirror - which in this case means Major General Patrick Sanders, assistant chief of the defence staff. Far be it from SubScribe to question the general's expertise in natural phenomena, but what about famine, drought, tsunamis? To be fair, Sanders qualified the phrase with an 'almost'. Without going into the semantics of whether something can be 'almost unparalleled' any more than it can be 'almost unique', that seems quite an important word the papers have omitted - although their consciences won in the text. Away from the storms, the Express forgets that its arthritic audience and all their relatives with dodgy tickers, dementia and diabetes are far more likely to be dismayed than cheered by Mark Carney's disinclination to raise interest rates, and gives the plight of savers only second billing to the joy of mortgage holders. Mitchell was accused of calling Downing Street police 'plebs'. He denied using any such language but resigned as chief whip (in the end). Then came an award-winning Channel 4 investigation that seemed to prove Mitchell had been stitched up by the police. Officers were arrested, one was sent to jail. Mitchell talked of libel actions and others talked of a possible return to government. Cue former policeman Ian Richardson, who was on duty at the time and who has now told the Times crime editor Sean O'Neill that he still believes Mitchell used the dread word. 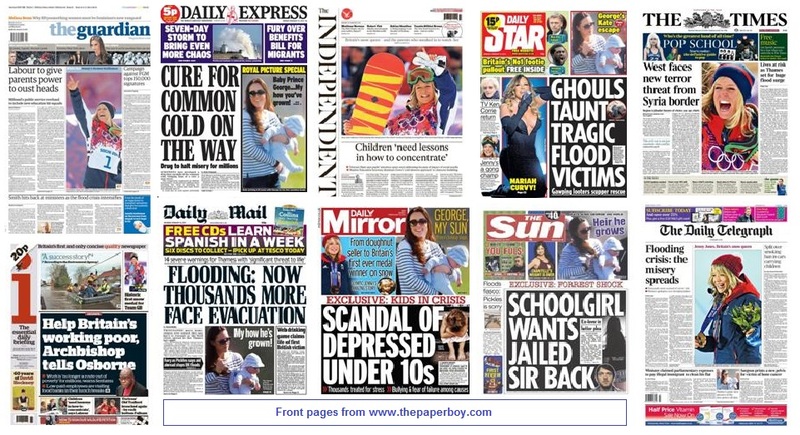 Leo McKinstrey (Express) Eco-zealots, aided by the supine political class, are using the floods as a propaganda weapon in support of their guilt-tripping, interventionist agenda of more green taxes, more regulations, more wind farms and higher energy bills. That illustrates how cynical and opportunistic they are. David Aaronovitch (Times) We should stop having silly debates about why we don't spend so much on flood defences as the Dutch. It's like asking why we don't have the forest fire-fighting capabilities of Australia or the earthquake planning of the Japanese. Rod Liddle (Sun) Our weather is extreme but this is not down to global warming. It's absurd to label each and every variation of our weather on global warming. It's just Britain doing its usual thing. known so many senior women so dismayed by theoneupmanship games of male politicians. More effort will be needed to stop the haemorrhaging of female talent than merely tinkering with working practices. The old party-based system of politics must change. John Gapper (FT) A problem for Barclays is that there is no such thing as a banker. There are equity brokers, foreign exchange traders, mortgage salespeople, corporate financiers and all kinds of specialists under one roof. There is no single set of employees unified by a professional culture and a willingness to pull together. Martin Kettle (Guardian) Cameron has plenty to learn from Stanley Baldwin, a true one-nation Tory and a great communicator who knew the art of establishing a political persona and sticking to it. When the Mail gets a bee in its bonnet, nothing is going to deflect it. Yesterday it demanded that the foreign aid budget be raided to provide help for flooded families here. Today it proclaims that it has secured 100,000 signatures for its petition and it's going to hammer that fact home, even if the Prime Minister does say 'money is no object' - the central point in the leads to the Telegraph, Guardian and i. The Sun, too, is seizing the opportunity to push its own agenda - ie, a bit of publicity-seeking. How many friends will it win with that heading? Probably not as many as it dos enemies. And don't get the wrong idea about that Iraq war hero. He's heading up the real (if belated) rescue effort, not the Sun's blondes in T-shirts brigade. 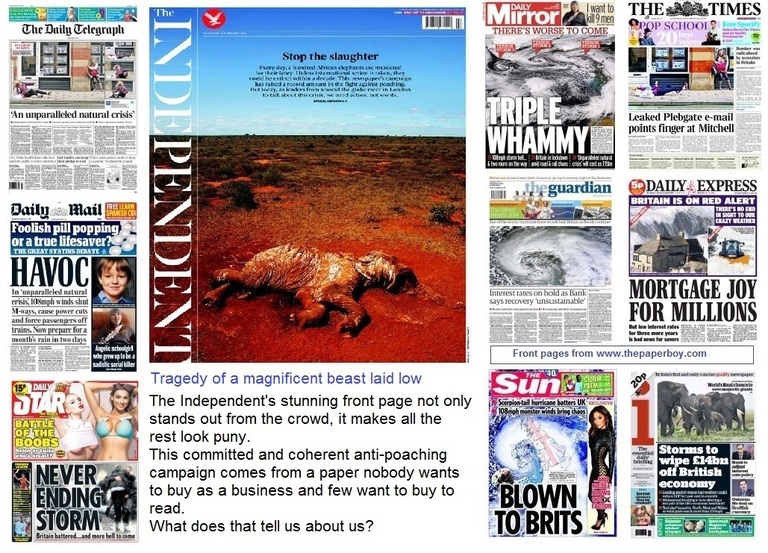 The Independent (why the colon after 'water torture'?) and Times tell us we're in for a sodden spring and the Express is never happier than when it can predict another storm on the way. This one is a superstorm. Darwin, which will bring in hurricanes today, apparently has a 'stingjet' just like the one that drove the great storm of 1987. But the Express is getting bored now that everyone else is charging around on its favourite subject, and devotes only a page and a half inside, where the others manage four or even six. The Telegraph and Times both steer clear of the water pictorially and go back to the tried and trusted Kate formula. They both call her the Duchess of Diamonds. This is because she went to the National Portrait Gallery wearing a diamond necklace loaned by the Queen. Woman wears necklace is obviously a front page story (especially when, as in the Times, you can't see said piece of jewellery). The Mirror comes up with one of its dramatic front pages for the little girl killed by the family dog, while the Daily Star returns to what it does best: CBB. 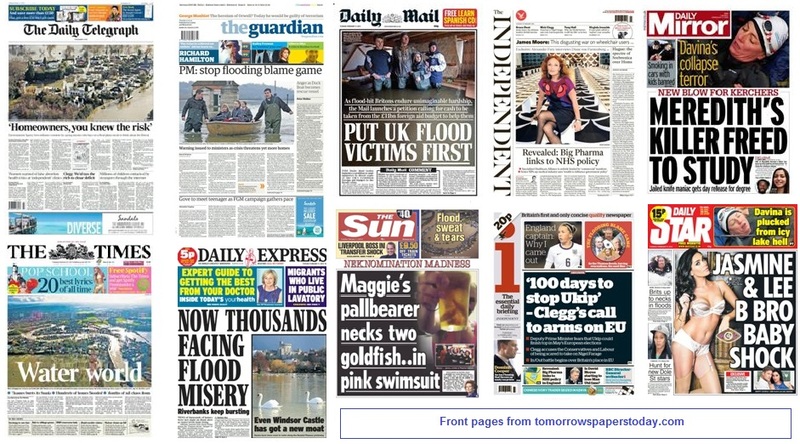 It also came up with the day's best flood picture coverage on pages 4 and 5 (below). Matthew Norman (Independent) This is not Katrina, and the PM’s show of feeling for victims and feigning of command probably came in time to forestall direct comparisons with Dubya gazing blankly down on New Orleans from Air Force One. Even so, his response was as shamefully dilatory as Mr Pickles’s cack-handed playing of the blame game was banal. are having to endure the trial of several politicians descending on their ruined homes and uttering platitudes. Simon Jenkins (Guardian) Hardly anyone has been seriously hurt, but the gods of hearth and home are angry because 'nobody told them' and insurance may cost another £10 a year. Someone must be to blame, so macho politicians must want the Environment Agency wound up, the Treasury hanged and the buck passed to the 'mess left by Labour'. Alice Thomson (Times) The floods highlight the coalition’s neglect of rural Britain. Tories are constantly being tripped up by rural mistakes. Now backbench MPs from muddy constituencies hope the Government will use the floods to reconnect with rural roots. Whatever extra needs to be spent on flood defences should be found from the 99% of the budget that does not go on foreign aid. Flooding now important as river into London seriously affected reported the spoof news site News Thump yesterday. And, sure enough, the Thames pulls the story back to the top of the schedule for the metropolitan-minded Times and Guardian, making it the lead to five papers. It even wins a puff slot in the Sun. The Telegraph continues to be outraged by Chris Smith's attitude. This time because he stated what to some of us seems to be obvious: 'Anyone who buys a property in a flood plain needs to think about the flood risk that property faces." The Mail continues to beat Nigel Farrage's drum, demanding that some of the overseas aid budget be diverted to improve flood defences. The Mail doesn't care for taxpayers' money being spent abroad helping people having to cope with poverty, disease, famine and rather more than a fathom of water outside the front door. Nice to see all those graphics and maps showing the flood alerts in the Thames Valley. Strange that there have been so few of other parts of the country in the past few weeks. Hugo Rifkind (Times) The climate is changing so we must be better prepared for extreme weather. Barring a sudden technological miracle, an autocratic world government or a global outbreak of generational selflessness, the greater part of meeting the challenge of climate change is going to be coping with the results of previous inaction. Ed Miliband (Guardian) Just as it is One Nation Labour’s cause to tackle unaccountable power in the private sector, so we will tackle it in the public sector too. Labour will not retreat into some old-fashioned top-down model and we know the answer is much deeper than a simple market alternative. Kevin Maguire (Mirror) Miliband is about to have the last laugh on Tories who mocked him for saying that he was starting with an open mind. Soon he’ll have policies coming out of his ears. Clive Aslet (Telegraph) says that at a time when the wet weather has caused misery for thousands, it should be remembered that agriculture is essential to feed the world's growing population and that farmland should be cherished, not neglected.